After sharing our new laminate kitchen countertops last week, I thought I’d share some other real homes with laminate countertops. From kitchens to laundry rooms, I’ve rounded up ten images to show that today’s laminate isn’t your grandma’s laminate. 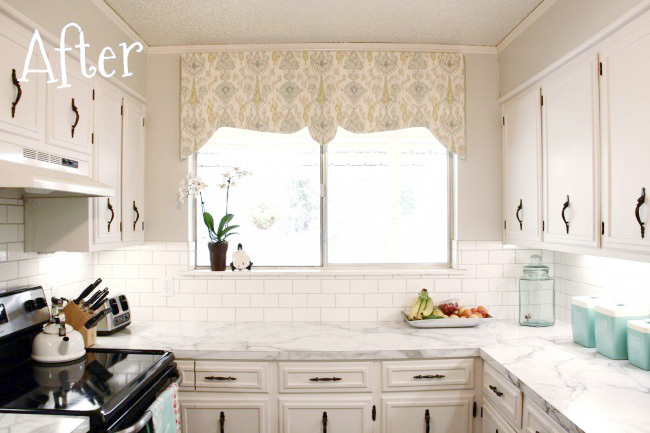 If you’d like to read more about a laminate countertop used in a particular image, click on the blog name under the photo. Like I said before, laminate has come a long way. So what do you think, would you save $$$$ and put laminate in your home rather than real stone? These look amazing. Now maybe I can convince my husband that changing out our current laminate can be done without breaking the bank. Thanks for sharing these photos! Definitely! Especially if you get multiple quotes. To me, the marble ones look the least like laminate. Which is not what I would have anticipated. I agree. I tried a slab of marble laminate in our kitchen, but in the end I decided that it didn’t fit quite right. Thanks for posting these examples – I think my favorite is the one in Drew and Vanessa’s kitchen. I like the concrete look. But it’s pretty amazing how far laminate finishes have come in the last 10 years or so – these all look pretty great! You’re welcome! Yeah, I think there’s a soapstone-looking laminate, which also gives the concrete look. 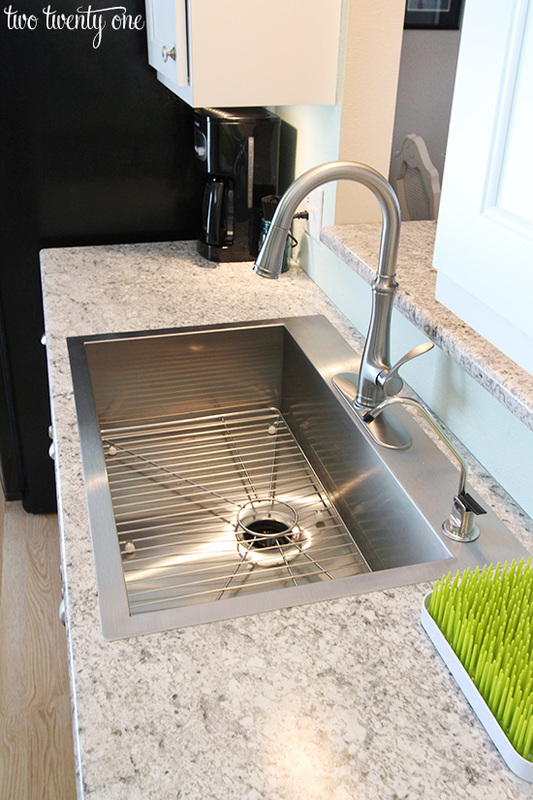 I know concrete countertops have become popular but they seem like a lot of work. I love all the curved edges!! They certainly don’t look like laminate anymore. Right? The edges have some a long way too. There’s a lot more options than there used to be. 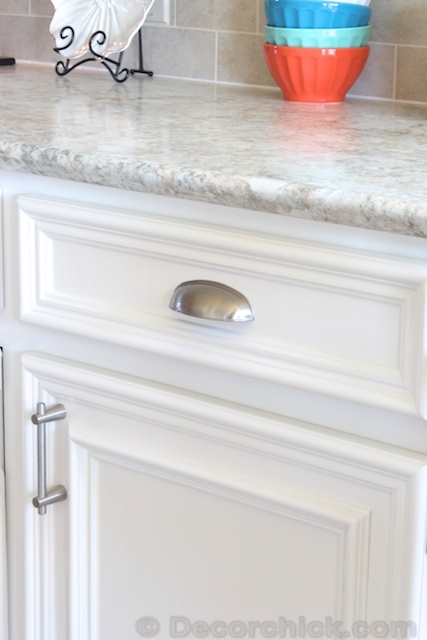 Due to our budget, we went with laminate tops that had the look and feel or marble, they even have the rounded lip on the front. No one can tell the difference and we got it at Home Depot! That last picture of your parents’ bathroom looks like it might be the exact same laminate I have in my kitchen. I love it! We didn’t think we’d ever get the money back if we put granite in our house (it just isn’t a granite sort of house/neighborhood), and I’ve never regretted our laminate choice. It looks nice, low maintenance, and you can’t beat that price. 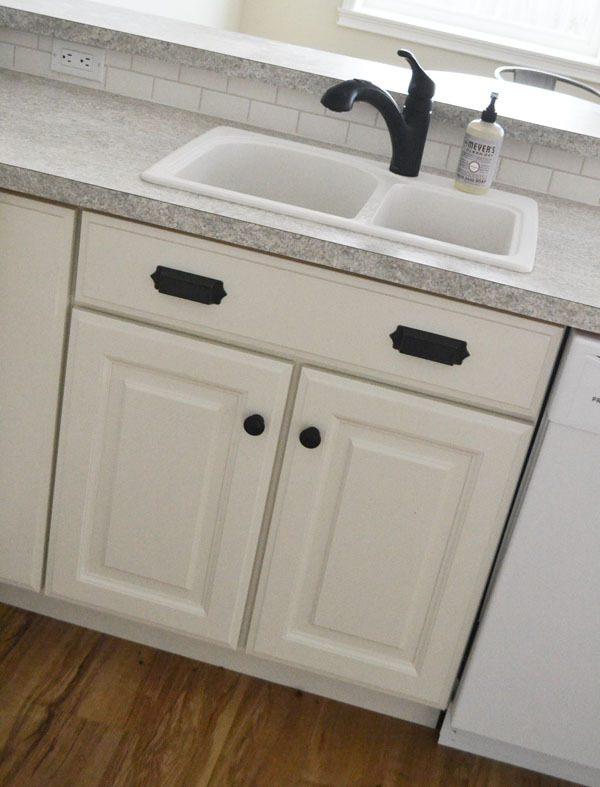 And not that it matters a whole ton, but I’ve had quite a few guests in our house think that they actually were granite–they have definitely come a long way in making beautiful laminate countertops! Laminate twinsies! I totally agree– not every house is a granite countertop house, and there’s nothing wrong with that. I’m all about making laminate cool. Thanks for this! If we ever replace our counters, we will definitely choose new laminate, vs replacing with stone. We don’t live in a house where it would make sense, and I can’t ever foresee it being in the budget. Thanks for sharing these beautiful examples! Most of those look like stone instead of laminate too. I am young with four kids, I’d go with laminate and spend the extra money somewhere else!! I totally agree! To some people granite is a must, but I’d rather spend the money in other areas of the house. 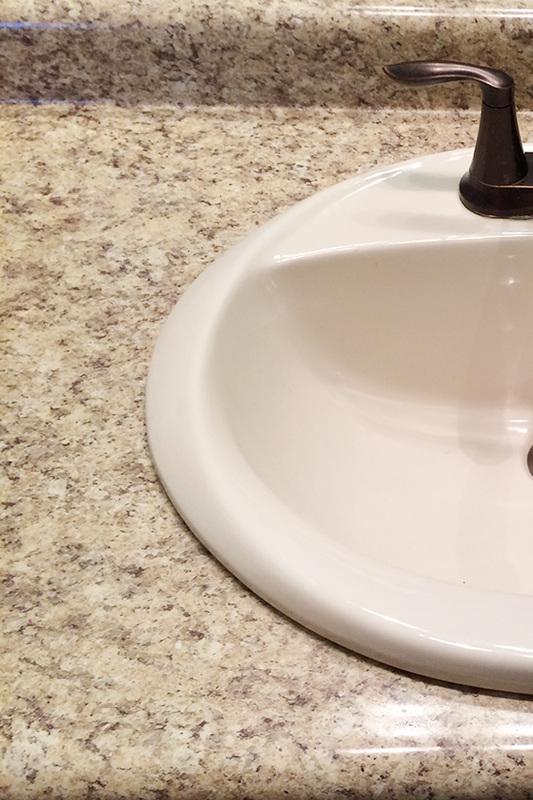 We just DIYed our bathroom counter from a laminate sheet, even though we couldn’t get a rounded edge doing it ourselves I love the way it turned out. 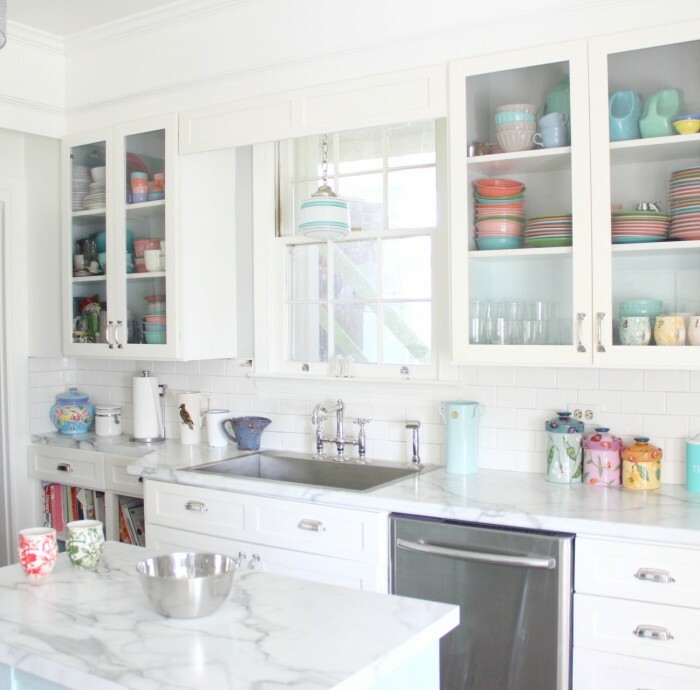 Seeing your kitchen is making me get the itch to start redoing mine, laminate counters are the way to go! Also making a comeback in my opinion, luxury vinyl flooring, easy on the budget and on the eyes! That’s so cool! I bet you saved even more money by DIYing it. And I totally agree about the luxury vinyl flooring. We have vinyl in our bathrooms and it’s hard to tell that it’s not real tile until you walk on it. So true! Hah! Thanks, lady! They look so real! The laminate that looks like stone…really great! I am no seriously considering adding it o my kitchen. We want to sell and buy, we have outgrown our home but still undecided. Adding it would really give is a good return, it would be a great investment. I completely agree. 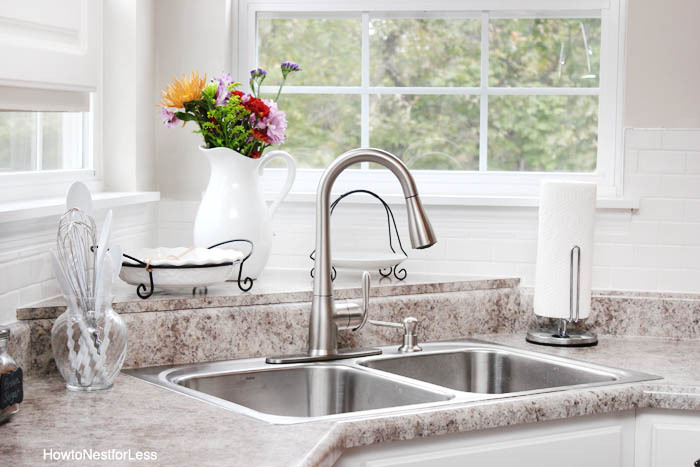 Kitchens and baths are what buyers are looking at so if you can update your kitchen with new laminate countertops you’d have a much easier time selling in the future. We recently put the marble laminate in our kitchen and I love it! Our house has gone down in value since we bought it =( so I couldn’t see spending extra on stone! 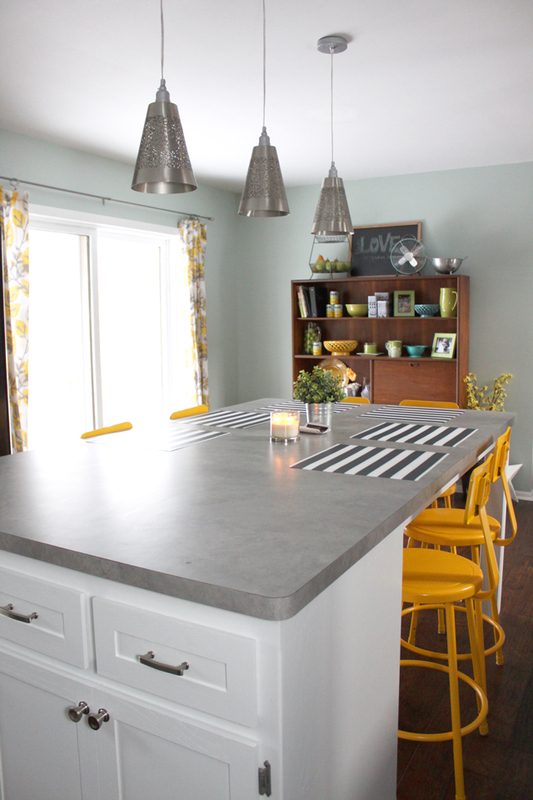 I’ve been thinking about doing concrete countertops as a DIY project but I’m a little gun shy. I originally had laminate countertops put in but we did them ourselves and kind of hacked them up, and they have taken a beating in the 5 years we have been living at our home! As well as our cooktop, laminated is great as long as you take care of it, unfortunately we haven’t done a great job at that. If I ever have extra money I want to go with quartz, super low maintenance! Thanks for sharing these photos! The laminate counter tops these days are very stylish. I plan on using laminate in our home remodel, the marble ones look amazing. do you have any more pictures of your parents guest bathroom or more information on the name and type of laminate? I too would like to know the patter name for the laminate in your parent’s guest bathroom. Yep! Absolutely , already in process with Travertine Silver from Formica 180fx collection. With the new Ideal Edge, you can’t tell the difference because there’s no ugly lines and it can now turn corners so no more flat glued on sides!! It’s beautiful especially in bathrooms or laundry rooms where hot pans are not an issue! We are remodeling our kitchen right now, and we have decided on laminate. After vacillating between quartz and laminate, we decided on laminate. The new choices and finishes are very attractive. I have a little bit of Arthritis and the cold touch of the solid surfaces is uncomfortable for me. Love laminate counter tops. They are tried and true. My previous home I had the same laminate for 24 years and still almost looked as good as the day it was installed. In fact the new buyers loved them. This home I put in Formica Dolce Vita. In 10 years laminate will still look good while the granite and quartz will be chipped and cracked. Also I think it will date a kitchen in the future. I also don’t like granite because it is so hard, doesn’t take the abuse like laminate does, and un-sanitary. As long as you don’t cut or put hot items on laminate it will stay looking good. 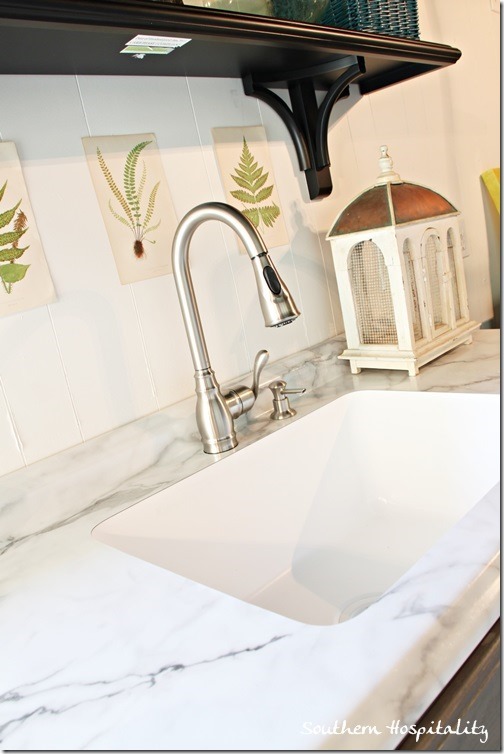 Hint – once in a while I use a product like Armor All or Countertop Magic on the counter tops. 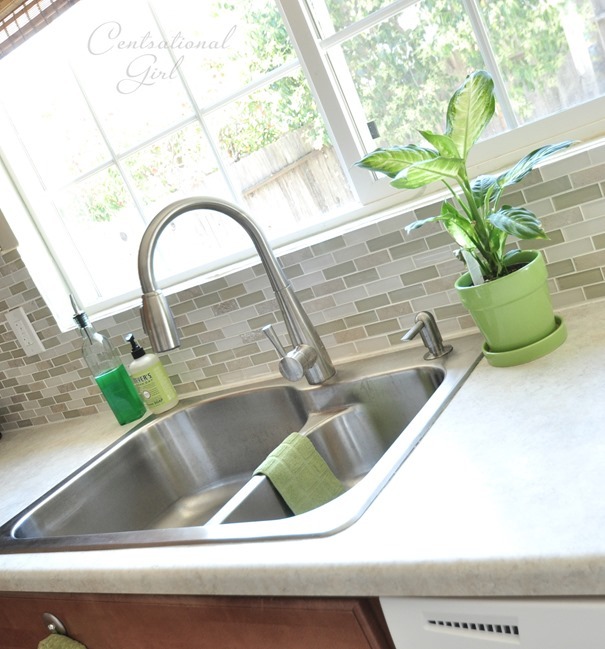 It brings back the deep rich color on faded counter tops and conditions new counter tops. Laminate is a oil based product and this replaces its oils. We have had quartz (Silestone) for 13 years now. We are super rough with them and they have never cracked or chipped. They are anti microbial because it is built into the resin. We are building a new house and we are starting with laminate for money reasons but I hope to go back to quartz in a few years. They only take soap and water to clean. If I fall in love with the laminate of course we will keep them.